But what do you do if you're trying to locate an older cemetery that has no street address or might be located some distance from the road? You can enter the Global Positioning System (GPS) data directly into Google Maps to display that location. Simply enter the lattitude and longitude of the location into the Search the map field. Of course this only works if you have allready visited the cemetery to obtaion it's GPS coordinates. A dialog box will pop up displaying the coordinates which can be copied and pasted for use elsewhere. To make this easier, copy the code and right click on your bookmarks toolbar in firefox. Then click "New Bookmark...". Paste the code into the "Location" field and give it a name. Now when you want to grab the coordinates, just click the bookmark and it'll automatically pop up coordinates for you. Or use the Google Map tool below. The latitude and longitude will be displayed for the position of the marker. Many older historic cemeteries can be located some distance from the road, in someone's back yard or in wooded or swampy areas and can only be reached on foot. Never attempt to drive off-road to search these sites out. You could easily find your vehicle stuck in deep mud or careening off a cliff. And always get the permission of the property owner before visiting these sites. Most GPS units do not display cemeteries by default. 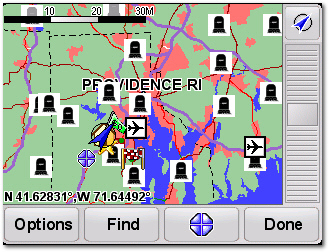 But cemeteries can be added and displayed on your GPS with a little work. You can add cemeteries to your GPS by adding Points of Interest (POI) files that you have created yourself or by downloading POI's made by others. A POI file consists of the database file and a companion image file so that the POI is displayed on your map. The process varies by GPS brand/model and I've only done it myself on mine, so I won't go into details here. Below I have links listed with complete instructions on installing POI files on the most common GPS devices as well as links to tools for creating and converting POI files and good sources of free POI files.